If you're a designer working in the advertising/marketing (or similar) industry, then you've likely done and said a lot of things you're not proud of. Sometimes because you were forced to by evil account people, sometimes because the crazy client had to have it his way, sometimes just out of spite because dammit if you were going to be someone's photoshop puppet. 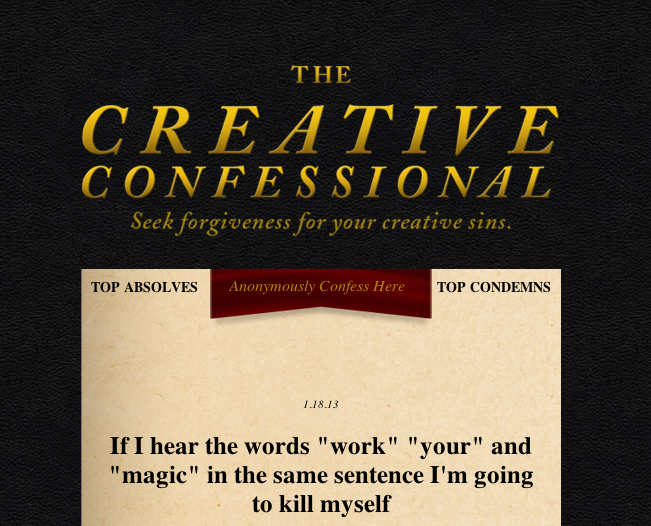 Whatever you're reasons, you can be absolved of your creative sins. Just simply visit The Creative Confessional and let it all out. Your fellow creatives can then decided to absolve you or condemn you for your horrors. Either way, there has to be a story more pathetic than yours somewhere in there.